1.Maximum support 32 GB SD card. 2.The image needs to select a "Baseline(Standard)" in JPEG format. 3.The digital pictures frame can handle 1000 photos. To guarantee smooth playback, we recommend storage within 300 pictures. Digital Photo Frame is the product can enhance family happiness, it keeps happy memories for you and your family by playing photos and videos . It' s also an ideal holiday gift for your family member and friends.Choose KENUO super HD digital photo frame, enjoy all your precious memories. We are responsible for your satisfatory shopping experience,if you have any question about the digital picture fram,please feel free to contact us,we' ll reply you within 24 hours. HIGH-DEFINITION: View your most cherished moments in quality HD resolution. or bring the most attractive media information to you customer. Supports 720p and partial 1080p HD video playback. 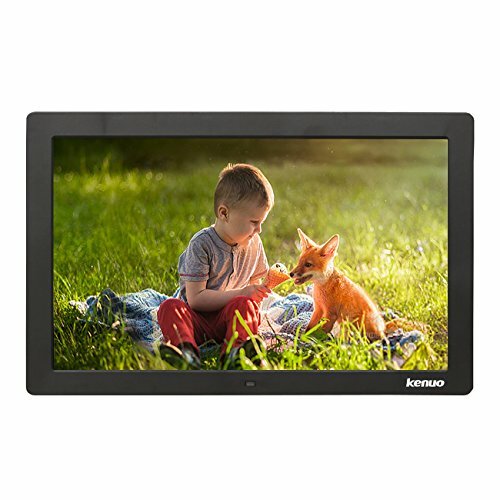 HIGH-RES SCREEN: The 13 inch latest in led screen technology brings you 1280 x 800 high-resolution 16:10 to display photos.support 1080P HD advertising video play. FANTASTIC EXPERIENCE：you can play photos with background music in the same slide shows for a fantastic user experience! just press the "calendar" button in the remote control when you play the picture. EASY TO USE :With no required setup and no software to install, it's ready display your photos instantly - just turn it on. Supports USB drives, MMC, SD, MS, SDHC . If you have any questions about this product by Kenuo, contact us by completing and submitting the form below. If you are looking for a specif part number, please include it with your message.